Ryan Gosling is quite the gentleman waiting for Emma Stone to take a seat first. Ryan Gosling jokes Emma Stone owes him money which explains why they're working together for a second time. Emma Stone wants to keep working with Ryan Gosling as much as possible. Ryan Gosling used higher pitch voice for Gangster Squad b/c of tight costume: "I channeled that irritation into anger for the gangsters". Ryan Gosling's method to creating his character in Gangster Squad: Bugs bunny dressed in a ladies outfit to get out of trouble. Their on screen chemistry sizzles - and it's even hotter in person. Emma Stone and Ryan Gosling posed with their fellow Gangster Squad cast members Josh Brolin at the Four Seasons Hotel in Beverly Hills on Saturday. But the gorgeous duo, who played love interests in the 2011 comedy Crazy Stupid Love, easily stole the show, throwing glancing looks and giggling throughout the photo shoot. 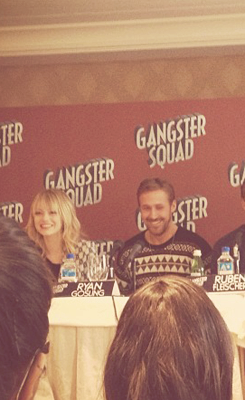 Gosling, 31, looked ready for the Christmas holiday in a wildly printed dark sweater and coiffed blonde hair. Gosling plays LAPD officer Jerry Wooters in the film which tells the story of the Los Angeles Police Department's fight with the east coast Mafia to keep them out of Los Angeles in the 1940s and 1950s.